The Volkswagen Beetle is a car we are all familiar with. More than 20 million were sold. While the name “Porsche” is associated with expensive cars, Ferdinand Porsche had a life-long interest in a small car that an average working person could afford. Porsche’s prototypes came to the attention of the newly elected chancellor of Germany - Adolph Hitler - and on June 22, 1934, Porsche signed a contract for the development of the “people’s car.” He agreed with Hitler’s request that the car should transport two adults and three children, cruise at 62 mph, and achieve 40 mpg of gas. No citizen took delivery of a Beetle before WWII started, but after the war production increased rapidly. By the end of 1946, 100 cars were produced a month. 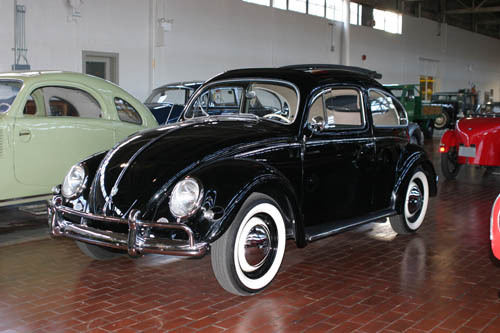 Beetles were exported to the U.S. in 1949, and the U.S. soon became the leading export market. While production ceased in Germany in 1978, Volkswagens were produced in Mexico until 2003. The “new” Beetle, a front-wheel drive, water-cooled model based on the Golf chassis, was introduced in 1998.